KANSAS CITY, Mo. — News of the Tivoli Cinemas' closure this week came as a shock to many movie-lovers across the Kansas City metro. "It's like an era has come to an end," said Gail Barham, who saw one of the last showings at the Westport cinema on Thursday. "It's too bad the city can't, or people don't, support it," Margaret Juhnke, another patron, said. The theater faced an uphill battle in a changing film industry. "There's streaming services. There's a lot of movie theaters playing the same kind of movies that we play," said Jerry Harrington, the Tivoli's owner. 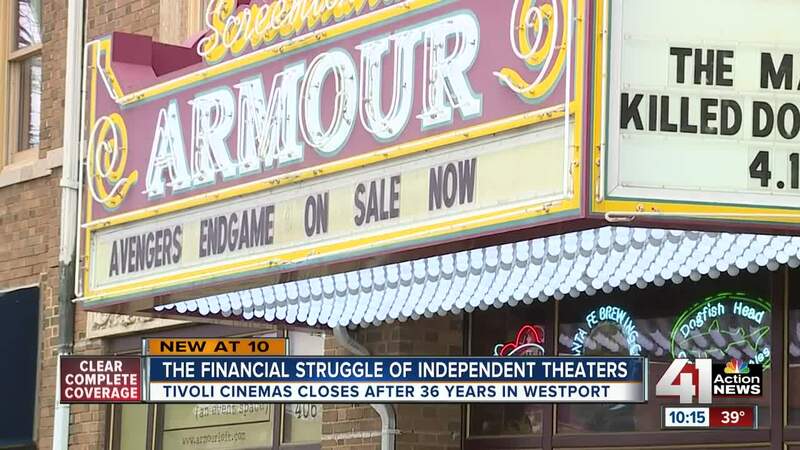 While he described it as a "tremendous loss," the closing did not come as a surprise to Adam Roberts, who co-owns and operates the Screenland Armour, an independent theater in North Kansas City. "As somebody who does this every day, it's not very shocking," he said. Roberts also cited streaming, as well as the growth of massive theater chains, as major obstacles for independent theaters to overcome. To keep his cinema's doors open, Roberts said he has focused on diversifying. "If you're a small guy, I think you kind of have to do it all," he said. That means a full bar, food, arcade games and a variety of movies. "We do art house, we do independent and we do retro, but we also do the big blockbusters, which kind of pay for us to do those smaller things," Roberts said. The Screenland Armour's recent two-screen expansion was funded through a Kickstarter campaign, as was its conversion from film to digital. It was the same for the Tivoli, and with that box office selling its final ticket Thursday, Roberts has a message: shop local and watch local. "I always think people say I wish I would've gone there more or people think if I'm not going there, surely someone else is going there," he said. "If everyone's thinking that, then that's how these things disappear."